Writers! If you’re starting a monthly novelling challenge, or if you want to blast past your word count targets this weekend, I have just the thing for you! I’ve had so many requests for various tracking worksheets, that I decided to create an entire bundle of them. 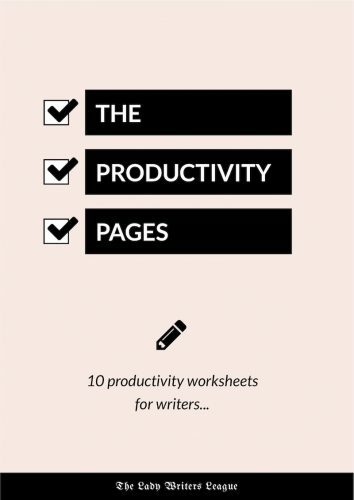 The Productivity Pages includes 10 elegant and FUN worksheets that you can use to set and track all of your writing goals. Be Ambitious. Write More. Finish More. Fill in The Writing Session Dash for a visual representation of your most productive writing times. Keep up your momentum on several writing projects with The Multi-Story Week worksheet. Regain your daily focus and always know where to begin writing with The Daily Writer. Make the most of your limited writing time with The Weekend Writer. Keep your eye on your big yearly goal with The Yearly Round-Up. Break down and schedule individual scenes with The Story Scheduler. Note down those little, incremental, hard-to-measure tasks with the Small Steps worksheet. Keep tabs on submissions, beta readers, or editors with The Project Post. Set your monthly target and fill in your daily progress with The Monthly Challenger. The Productivity Pages encourage you to pick up your pen. This digital download includes 1 PDF file which you can view using any PDF-reading software, your browser, or your mobile device. Your worksheets will be available for instant download as soon as you complete checkout. The worksheets are A4, but you can easily print them two-to-a-page and use them in A5 planners and notebooks. You don’t have to print these worksheets – you can handwrite on them using any touchscreen device. Lady Writers League members: you can download The Productivity Pages in the Library.